We were very pleased with the number of vehicles that we had at our event. We were told that it was more than Bend had last year - matching what a much bigger city had in our first year was a nice accomplishment. We had a few people stop in after they saw the signs or the gathering in the parking lot, but most saw it on our Facebook. Next year we could probably do an even better job advertising it. First Annual Midstate Electric Tailgate Party! Come see in person several different models of electric vehicles, learn about EV charging, and grab a bite to eat. Stay tuned for more information! 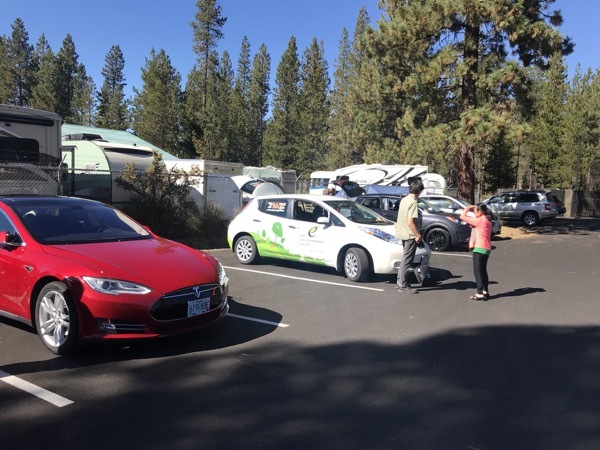 Registered attendees report 66,000 electric miles driven.